There was no way I was going to call this post getting my body back as I am under NO illusion how hard post birth will be. As much as I have had plenty of pals whose bodies have sprung back to 'normal' very quickly after birth, I know my shape will have a difficult time. I will have a new body to adjust to and one that will deserve all the praise following the fertility treatments, the miscarriage and then labour, so all I want to focus on is getting some of my fitness and strength back which is something I loved doing pre-baby. I was invited to pick a couple of items with JD Williams from their super expansive sport and leisure ranges to help me get back on my feet when the time comes, and I had a pretty difficult time deciding considering the amazing brands they stock. Adidas, Puma, Regatta,and Ellesse are all there among affordable lines designed for anyone to get into fitness which is an approach I am a big fan of. Not everyone has a swish leisurewear budget to play with and I would hate that to put anyone off from trying. Another thing I noticed about their products is they also cater to larger sizes which is a huge thumbs up. Having been far bigger in the past I know how daunting fitness and exercise can be from the outset, never mind being met with the idea of tiny gym clothes that you can only imagine suiting one type of body shape. With Sports bras with sizes up in the 40's and outdoor jackets in sizes up to 30, they really do cater to a wide audience which is amazing. 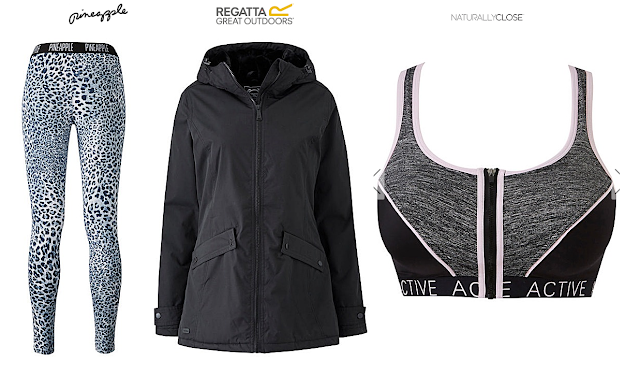 For my post baby slow comeback I am planning to just kick off with walking when I can and when baby allows so my top picks needed to include a sports bra an outdoor jacket and some new leggings. I was overwhelmed with strong choices in the sports bra department and in the end settled for this front zipping number which handily helps make it breastfeeding friendly too- a double win. For the outdoor jacket I have had various Regatta jackets in the past and always been impressed with their performance twinned with looks and price so decided to go with this chic black number with warm fleecy lining in the hood. The Brianna jacket is slimming, super practical and goes with everything- ideal!! Lastly I needed new leggings and how could I say no to these loud print beauties!? Love the colours, love the style and love that they are in fact high-waisted, I am already so excited to get wearing them. Pineapple always have the jazziest designs. I picked up a nice basics black tshirt to pair with them and it is super comfy and lightweight so pretty perfect for getting out there with the pram!